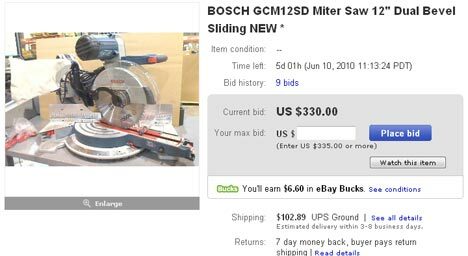 The newest Bosch miter saw (GCM12SD) was just announced a few days ago and is not scheduled to be released for a few months, but it looks like Ebay is ahead of the game. Ebay has a listing for the new saw with the current bid at only $330. The company selling the saw lists themselves as a freight recovery specialist, so I would guess this is a saw that never made it to its proper location and is probably something Bosch is missing. Check out the listing for yourself, but I would not be surprised if it ends up being pulled.